Create a Gantt Chart in Excel with almost no learning curve. 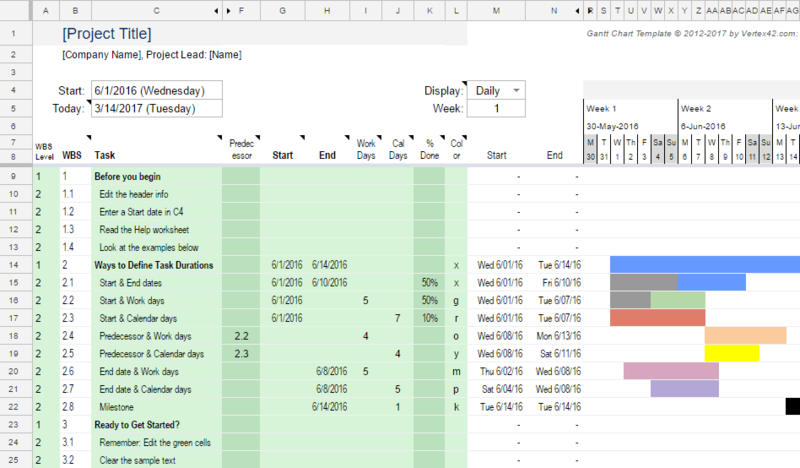 "Almost everything we do is in Excel, so a Gantt chart in Excel just makes sense." 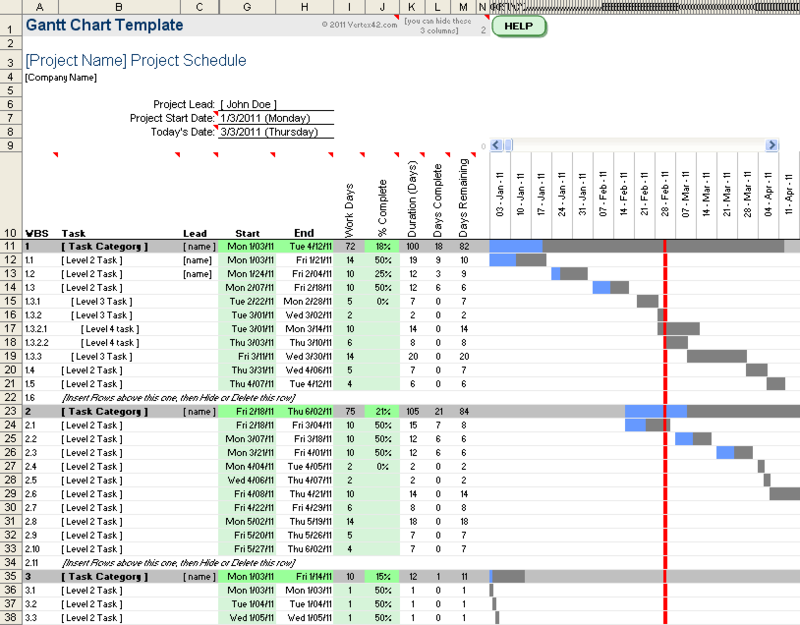 Gantt Chart Template Pro is a spreadsheet designed for Excel and Google Sheets that makes creating project schedules easy. It includes many features that make it even more useful than our free gantt chart or project schedule template. New Version 4.0 - 7/19/16: The blog article "Gantt Charts Made Easy" describes the changes and improvements made in the new version. You can still download the older versions, including the versions shown in the screenshots above and the one demonstrated in the video. And don't forget about the Google Sheets version! You can take advantage of the Excel knowledge that you already have. There is no installation. Just open it up in Excel and start creating your schedule. Using the template requires only basic Excel knowledge. Switch between Daily, Weekly, and Monthly views with a simple Excel drop down. Create dependencies between tasks by defining predecessors or using Excel functions. Track the completion status of tasks and sub-tasks by entering the % Complete for each task. 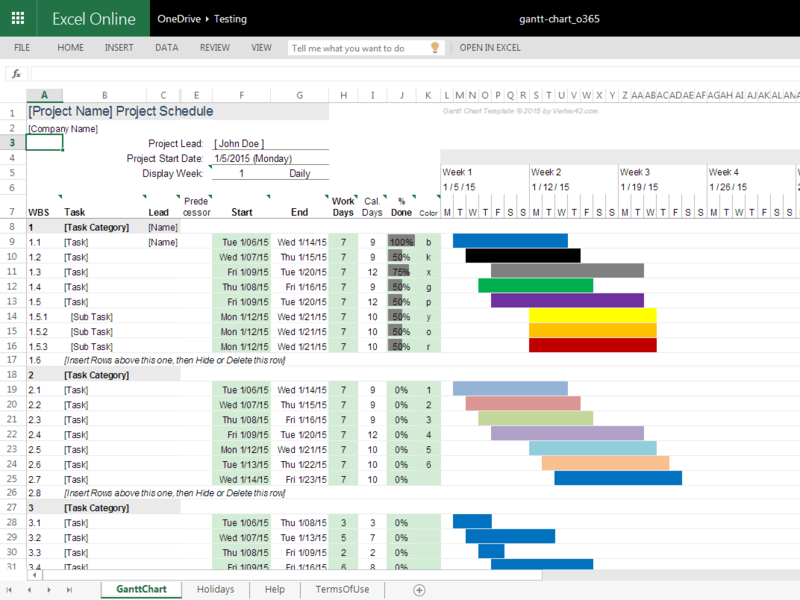 Color-code tasks however you want by using Excel to format rows, or use our built-in color selection to change the colors of the bars in the gantt chart. Define the duration of a task by the End Date or number of Work Days or Calendar Days. Optionally exclude holidays and other non-working days when calculating task durations, by just listing those dates in the Holidays worksheet. Sharing and collaborating is a breeze because most people already use Excel. Store the file on a private network location (or email the spreadsheet to your team). Use our Google Sheets version. Color code tasks by project lead and/or urgency. The template is not an all-in-one project management tool, but it is not meant to be. One of the huge benefits of using Excel is its versatility, and we've tried to keep the template simple enough for you to continue taking advantage of that. Gantt Chart Pro is completely unlocked (no password protected worksheets), so you can customize it by adding columns and other worksheets as needed. The files do not use VBA macros, but there is nothing preventing you from adding your own. Much lower cost than other project management software like MS Project. A single license lets you share the file with your whole team. This alone results in huge savings. Buy it once, use it forever. No subscription required. Free updates. Unlocked - The pro version does not use password protected sheets, so you have access to all Excel features. Customize, adapt, or integrate other tools. Free Updates - We will never ask you to purchase an upgraded version. You can simply return to the download page to get the latest version and bonus files. Affordable for the Entire Team! When you buy this template, you are buying it for your entire team, not just a single computer or user. Different versions of Excel (2003, 2007, 2010, etc.) may allow or prohibit different features, so you can download the file(s) that will work best for the version of Excel that you and your team are using. See the Help Section below for more details, video demos, and frequently asked questions. The following bonus files are included with the purchase of the pro version. Each is a separate file, and there is no automated means of transferring information from one file to the other. The new Desktop/Mobile/Online version was designed to work in Excel Online, Excel 2010+ (including 2016 for Mac), and Excel for iPad/iPhone (See our Blog Post about this new version). This is a great version to use for collaboration. You can save it to your OneDrive account so that you and your team can access it from multiple devices. The main functional difference is that the completion status of each task is displayed as a progress bar in the % Done column rather than changing the color of the bars in the chart area. The Pro version for Google Sheets does almost everything that the XLSX version does. Like the Excel files, you are allowed to share it privately with your team and it works great for collaboration. Note: The Google Sheets version is based on the new Excel Online/Mobile version. Create timeline charts quickly and easily using our new Timeline Template ($19.95 when purchased separately). 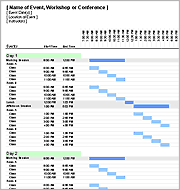 This Event Schedule is great for scheduling classes or presentations for workshops, conferences, and seminars. 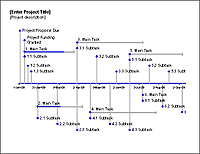 It was created as a variant of the gantt chart template, but is based on the use of Times rather than Dates. Use this template to define a process that spans only a few hours. Durations are entered as times instead of days. Download a pre-populated project schedule for 3 different sample projects: (1) Home Construction Project Schedule, (2) Custom Software Project Schedule, (3) Website Development Project Schedule. These templates use the Predecessors feature for defining task dependencies. Note: The outlines are generic and the durations are fictitious. Both .XLS and .XLSX versions of these files can be downloaded. Master Excel one tip at a time with our new Excel tips workbook. It contains over 100 useful tutorials and is currently priced at $19.95 when purchased separately. You'll get one license free along with your purchase of Gantt Chart Pro. 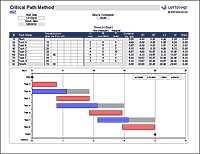 Analyze your project schedule using the critical path method (CPM) with our CPM spreadsheet ($14.95 when purchased separately). I placed answers to most of the questions that I get asked in a Help section within the GanttChart worksheet. You are welcome to contact me if you have other questions, but please take a look through the Help worksheet and the Gantt Chart technical support page first. If you are just getting started, make sure to watch the following video demonstration. You use Work Breakdown Structure (WBS) numbering to organize your tasks in an outline form, as shown in the image to the right. You could enter your own WBS numbers manually, but we have included formulas so you do not need to update the WBS numbers every time you insert a new row. To indent the text in the Task column, you can modify the cell formatting to include an indent (shortcut: Ctrl+Alt+Tab), or add spaces before the text. Update 7/19/2016: In the new Pro version 4.0, both the WBS numbering and indenting is automated by just selecting a WBS level from a drop-down list. See this article. You can switch between a daily, weekly, or monthly view by selecting the option from a drop-down list at the top of the gantt chart. For details on this new feature, see the blog article Creating a Gantt Chart with Excel is Getting Even Easier. You can choose which set of inputs you want to use for defining each task. In older versions, this was done by copying and pasting from a set of sample rows at the bottom of the worksheet. Watch the video below to see how this is done. Update 7/19/2016: In the new Pro version 4.0, you no longer need to use different template rows. You just enter a combination of two inputs to define the start and end dates. Read this article or watch the video below to see how. You can use different methods within the same worksheet as shown in the image below (the inputs have green backgrounds). Various ways to enter task dates and durations. Work Days: You can define the duration of a task by entering the start date and the number of work days (excluding weekends and holidays). This is a critical feature for a project plan when you are using dependent tasks, because if the schedule changes and the start date changes to a Friday and requires 3 work days to complete, you want to make sure that the new schedule has this task ending on the next Tuesday, not Sunday. Duration: Enter the number of calendar days for a task. Some projects use 7-day work weeks, or require Saturdays or Sundays to be work days, so this option allows you to handle these cases. End Date: Choosing the end date can be useful when you have a deadline that forces you to complete a task by that date. Work Weeks Other Than Monday-Friday: If you are using Excel 2010 or Later, you can use the latest versions of Gantt Chart Pro to define which days of the week are your standard work days. These files use the WORKDAY.INTL and NETWORKDAYS.INTL functions. The XLSX versions lets you choose different colors for the bars (default=blue, r=red, k=black, o=orange, y=yellow, p=purple, g=green, 1-6 = theme-based accent colors). 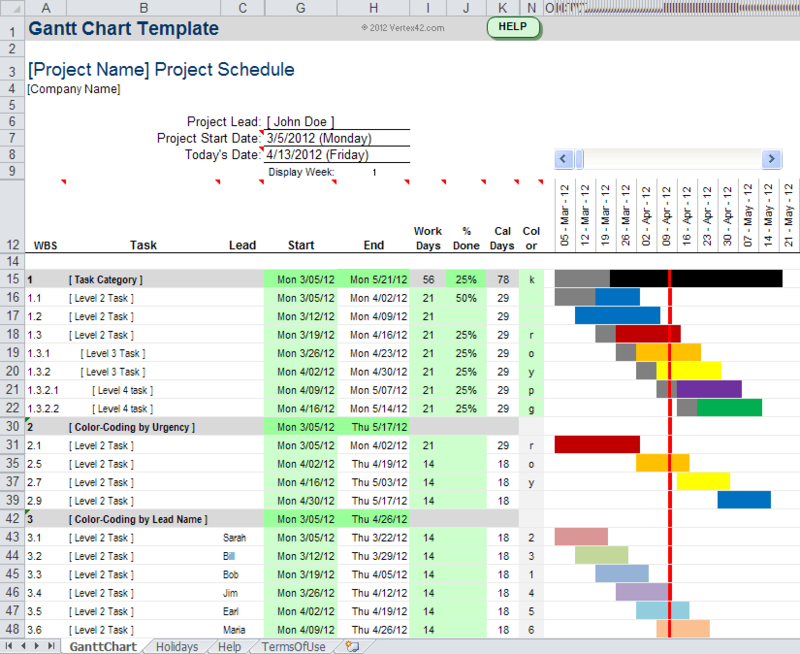 Or, you could create your own formula to color-code your project's tasks based on the task owner or the urgency. The XLSX versions require Excel 2007+ for the PC or Excel 2011+ for the Mac. Even though the time-span displayed in the chart area is limited by the number of columns, the slider bar lets you scroll through a project that spans many months and years. The scroll bar simply changes the first date shown in the chart. In the XLSX versions, you can add columns to increase the displayed time-span, in case you want to be able to print the entire schedule at once. Scroll bar for changing the range of dates displayed. Version 2.2 introduced a new option for creating task dependencies. Normally, if you want to make a task start after the completion of another task, you would enter a formula for the Start date like =enddate+1 or =WORKDAY(enddate,1,holidays), where enddate references the End date of the Predecessor task. That isn't too hard, but you can't tell by just looking at the chart that there is a dependency. We've added a new feature where you create dependencies by referencing the WBS number of up to 3 Predecessor task(s). If you reference the WBS using a formula as shown below, the reference will remain correct even after you insert new tasks. You can also enter the WBS number manually if you want to, as long as you enter the number as text. To enter a number as text, add an apostrophe before the number like '1.2 instead of just 1.2. Creating task dependencies by referencing Predecessor tasks. Not everyone wants to use this approach, so in some of the older versions, the Predecessor columns are hidden by default. If you want to use this method, just unhide all the rows and columns. Use the Holidays worksheet to list the dates for holidays and other non-working days that you want to exclude from Work Days. 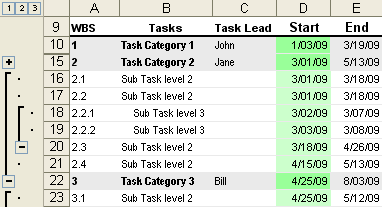 You can use Excel's grouping and outlining feature to hide or show groups of tasks. See my article on Grouping and Outlining in Excel for an explanation of how to use Excel's "Group and Outline" feature for expanding or contracting groups of items. 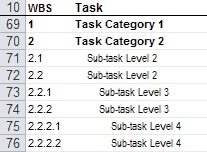 Grouping and WBS numbering in the gantt chart. How do I easily move data from the free gantt chart to the pro version? There is no automated import/export feature (mainly because of the ability to use custom formulas to define dependencies). But, you can copy and paste the WBS, Task, and Task Lead, and that will give you a good start. First, add rows to the new version to mimic the outline in your old version. After you have copied the WBS/Task/Lead data to the new gantt chart, you will need to step through each task to define the start date, end date, duration and dependencies. Can I add columns to the Gantt chart? This is one of the most frequently asked questions about the pro version of the gantt chart. The answer is a most definite yes. For example, you could add a column for indicating the number of people associated with each task, the budgeted cost, actual cost, etc. How do I make a task precede another task by N days? If you want to create a task that will automatically precede (start before) another task by a certain number of work days, you can use a formula for the start date such as =WORKDAY(reference_date, number_of_days, holidays), where "number_of_days" is a negative number of days and "reference_date" is a reference to the start date of the task you want to precede. 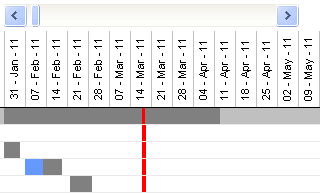 "holidays" is a named range in Gantt Chart Template Pro. This same technique will work for making a task start N days after another date (using a positive number_of_days). We've begun using our blog as a place to provide answers to common questions and other technical support for Gantt Chart Template Pro. The following are quick links to areas on our "Technical Support" page. The spreadsheet is being slow. How do I speed it up? How do I print my entire project? Can I increase the number of columns displayed in the Gantt Chart if I'm using Excel 2007? Can I enter and display dates in UK format (dd/mm/yy)? Can I import tasks into Microsoft Project? Green cells are inputs, but why do some contain formulas? How do I use the Percent (%) Complete? Why is the red line marking Today's Date not showing up?